The Official Website of Honda Cars Kalookan, Inc.
Get these HOT DEALS from Honda when you purchase a brand new vehicle from April 1 to 30, 2019. Visit us today! Low Cash-out and Low Monthly Amortization All-In Bundle – Customers shall be entitled to acquire this Financing Schemes for payment terms of 15% and 20% downpayment and 36 to 60 months term. Free One Month Amortization – applicable only to 15% and 20% downpayment with 60 months financing term. Free One Month Amortization is not applicable to Maybank of the Philippines. Customers are entitled to avail a free insurance package c/o BPI, RCBC, BDO, Robinsons Bank, Maybank, PNB, Sterling Bank, UCPB and Bank of Commerce (Security Bank, China Bank, PSBank and East West Bank DO NOT offer free insurance). Minimum amount financed required for BPI, RCBC, PNB, Robinsons Bank, Maybank, UCPB and Bank of Commerce is P500,000.00. For BDO amount financed required is P600,000.00 and for Sterling Bank eighty percent (80%) of amount financed. For more details about HOT DEALS from Honda, visit us now ! See posters and print ads for more details. Promo duration is from March 1 - 31, 2019 only.. Per DTI-FTEB Permit No. 3315 Series of 2019. Colors and specifications may vary from actual unit..
Manila, Philippines, October 2, 2018 – Honda Cars Philippines, Inc. (HCPI), Honda’s automobile business unit in the Philippines, is pleased to introduce the limited edition variants of the New CR-V, New Mobilio and New Civic this 2018 with enhancements which aim to deliver sporty and stylish vehicles to satisfy the needs and cater to the dynamic lifestyle of the Filipino Customer and their Families.Interested customers may now inquire and reserve at any of the 38 Honda Cars Dealerships nationwide. As Honda’s first ever Diesel Turbo availablein its local lineup, the New CR-V has been an exceptional model for Honda in the Philippines over the past year having sold 5,651 unitsas of September 2018. To celebrate this great market acceptance of Honda’s 7-Seater Diesel Turbo, a limited edition New CR-V Touring Diesel 9AT will be made available this year. Integrated witha new and aggressive Front Grille, Running Board, Rear Bumper Protector and an Exhaust Pipe Finisher, the CR-V gets a sportier stance for a bold and sophisticated exterior styling. To add, in order to differentiate this New CR-V model from all other variants, Honda has equipped this limited version with a Touring Edition Emblem. With the strong demand for 7-Seater vehicles here in the Philippines, Honda is set to launch another variant of the Mobilio, the New Mobilio 1.5 Premium CVT. This version of the Mobilio exclusively comes in White Orchid Pearl giving it a touch of elegance without spending a lot. The New Mobilio 1.5 Premium CVT is equipped with a Shark-Fin Antenna, Exhaust Pipe Finisher and aPremium Edition Emblemmaking it a stylish MUV for those living a well-rounded lifestyle. Only 100 units of the New Mobilio 1.5 Premium CVT will be available for a suggested retail price of Php 968,000. You can reserve at any Honda Car Dealership nationwide starting today and deliveries will commence in November 2018. Civic has been Honda’s epitome of a sporty car here in the Philippines. It has always been a head turner because of its sleek and sporty exterior, sharply defined character lines, and its sophisticated interior. 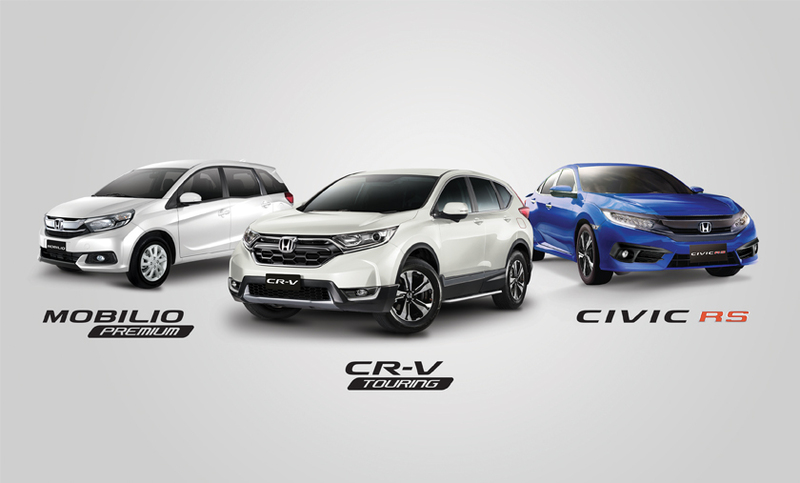 The Civic has been one of Honda’s best-selling premier compact sedan and because of this warm acceptance, Honda has been continuously improving products to cater to the growing demands of the Filipino Customers. For 2018, 30 units of the Brilliant Sporty Blue will be exclusively available for the Civic RS Turbo CVT variant. The New Civic RS Turbo CVT Limited Edition is availableat select Honda Dealerships with a suggested retail price of Php 1,576,000. As a treat to our customers, the New CR-V Touring Diesel 9AT andthe New Mobilio 1.5 Premium CVT are available with an exclusive Php 30,000 discount.Customers are encouraged to reserve, and be one of the few to own these Limited Edition Variants. For more information about these three new models, Honda’s latest news, products and events, visit www.hondaphil.com or any authorized Honda Dealership nationwide. Honda introduces the New 2018 HR-V designed to match the needs of customers who are looking for a sporty and stylish lifestyle vehicle. 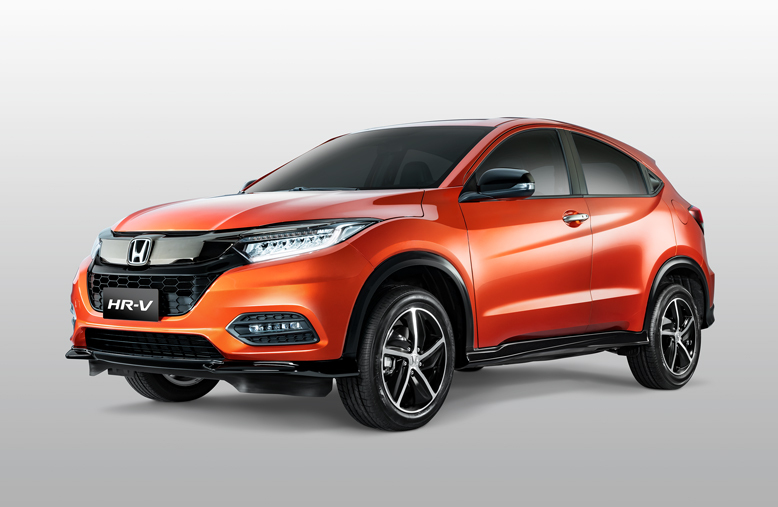 In addition to the New HR-V, a New RS Variant is now available which aims to give customers an enhanced sporty appeal of Honda’s compact SUV. Manila, Philippines – Honda Cars Philippines, Inc. (HCPI), Honda’s automobile unit in the Philippines, is pleased to introduce the New 2018 HR-V updated with modern sporty styling cues and advanced technology features which aim to give customers a stylish capable crossover with flexible utility and convenience elements expected from a Honda. For 2018, the New HR-V will now have a New 1.8 RS Navi variant that will satisfy customers looking for an enhanced sporty compact SUV. For 2018, The New HR-V now introduces new exterior styling cues. At the front, new features such as a newly designed Front Bumper, Front Grille and Full LED Headlights with Integrated Day Time Running Lights give the New HR-V a signature yet familiar Honda front fascia. At the back, new LED Guide Type Tail Lamps give the New HR-V a more futuristic styling, which not only gives it an up to date look but also makes it more visible on the road. Complementing this updated design is the new 17-inch Sport Black Alloy Wheels, which give the vehicle a more aggressive stance and presence on the road. In addition to its refreshed sporty exterior, the New HR-V retains its distinct coupe like advanced and sophisticated interior feel with its high center console, which give the driver and passenger that sports car like feel. In terms of features, the New HR-V receives a new 7-inch Touch Screen System now equipped with Apple CarPlay and Android Auto for a more intuitive smartphone - infotainment connectivity. Furthermore, the New HR-V is equipped with ULT (Utility, Long, Tall) seats, which allow three different adjustment modes allowing customers to have flexible seat configurations that can be adjusted depending on the customer’s need. Powering the New HR-V is Honda’s established 1.8 Liter SOHC i-VTEC engine that produces a maximum power of 142 ps at 6,500 rpm and 17.5 kg-m of torque at 4,300 rpm. Mated to a Continuously Variable Transmission (CVT) developed based on Honda’s Earth Dreams Technology, the engine and transmission provide responsive performance, acceleration and improved fuel efficiency. Honda’s Eco Assist System, which consists of the ECON mode and Eco-Coaching Ambient Light, helps encourage fuel-efficient driving. For 2018, a New RS variant will be made available for the New HR-V which gives it an enhanced sporty and sharp exterior design. Outside, the New HR-V RS comes with an RS design Front Honeycomb Grille together with the new LED Headlights. LED Fog Lights are also available exclusively for the HR-V RS and at the side, the HR-V RS receives Dark Chrome Finished Door Handles and Door Trims and a different two-tone 17-inch Alloy Wheel Design specifically made for the RS. And at the back, smoked LED Tail Lamps further enhance the sporty image of the New HR-V RS. Inside, the New HR-V RS receives additional upgrades which features a Full Leather Interior complemented with Piano Black Accents in the Steering Wheel and Center Console giving the interior a premium upmarket feel. For the RS Variant, the new 7-inch Touch Screen now also comes with a navigation system as standard. Capping off the overall sporty package of the New HR-V 1.8 RS Navi, the Phoenix Orange Pearl color exclusively found in other Honda RS Models will now be exclusively available for this variant of the New HR-V.
To ensure the highest level of safety and customer confidence with the New HR-V, all variants are equipped with advanced and class leading safety features namely the Electronic Parking Brake (EPB) with Auto Brake Hold,Anti-lock Braking System (ABS) with Electronic Brake-force Distribution (EBD) and Driver and Front Passenger SRS Airbags, Vehicle Stability Assist (VSA) and Hill Start Assist (HSA). The 1.8 RS Navi CVT variant will get additional Side Airbags for added protection for the passengers. With these superior safety features combined, customers are assured with better safety and peace of mind on the road. Copyright © 2019 Honda Cars Kalookan, Inc. All rights reserved.